Interviewed by John E. McAuliffe, Jr.
"Try It. You'll Like It!" "So, Do We Really Need It?...Yes, We Do!" Barry H. Grodsky is a partner in the New Orleans firm of Taggart Morton, L.L.C. He received a BBA degree, with honors, in 1979 from the University of Texas-Austin and his JD degree in 1982 from Tulane University Law School. He was admitted to practice in Louisiana in 1982. 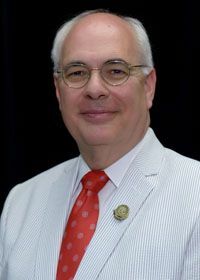 Barry served as Louisiana State Bar Association (LSBA) president-elect in 2017-18 and as secretary and editor of the Louisiana Bar Journal from 2013-15. He represented the First Board District on the LSBA’s Board of Governors and chaired the Committee on the Profession. He coordinates several law school professionalism programs for the Bar. In 2009, he accepted the American Bar Association’s Smythe Gambrell Professionalism Award on behalf of the Committee on the Profession. He is a member of the Budget Committee and the Bar Governance Committee and serves on the LSBA Fee Arbitration Panel. He also served on the Continuing Legal Education Committee. He received the LSBA’s President’s Award in 2008 and 2010 and the Bar’s Outstanding Service Award in 2013-14. He is an instructor at Tulane University and received the Tulane University Teacher Recognition Award in 1993. He was a Tulane University Faculty Fellow from 2000-02 and received the Distinguished Faculty Award in 2016. Barry and his wife, Cheri Cotogno Grodsky, are the parents of a daughter.